Given clear skies, everyone around the world will see the blazing planet Jupiter reaching its highest point tonight around 8 p.m. local time tonight. Moreover, everyone will see the waxing gibbous moon to the west of Jupiter. Watch as Jupiter chases the moon westward across the sky throughout the evening hours tonight. Depending on where you live worldwide, the moon will set in the west at late evening or after midnight. Then Jupiter will follow the moon below the western horizon in the wee hours after midnight. Our chart is designed for mid-northern latitudes in North America. As seen from our northern hemisphere, the moon lies to the right (west) of Jupiter. That’s because we’re looking southward when we view the moon and Jupiter, so east lies to our left and west to our right. 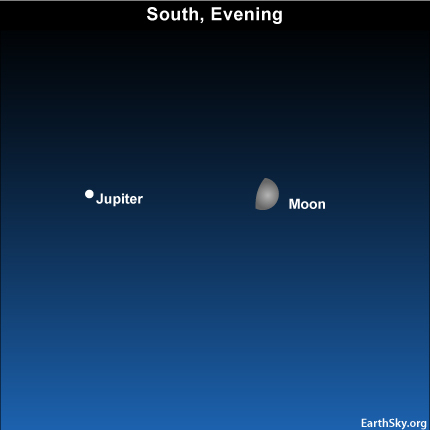 We’ll see the moon and Jupiter moving from left-to-right across our sky tonight. However, as seen from most of the southern hemisphere, the moon and Jupiter shine in the northern sky. Therefore, the moon is seen to the left of Jupiter. In that part of the world, the moon and Jupiter travel from right-to-left across the sky. However, there’s another subtle motion. The moon is actually moving eastward toward Jupiter, even as the two luminaries drift westward throughout the night. That will become obvious by tomorrow, as you see a fuller waxing gibbous moon pairing up more closely with Jupiter on Monday night. Site contents copyright © 2019 Recorder Online	except as noted. All rights reserved. | 88 queries in 2.345 seconds.